What is the Mobile Delta? The Mobile Tensaw Delta sits at a crossroads of biological diversity, history, and culture. The north-south spine of this region is made up of the great Mobile and Alabama River systems, representing one of the world’s most diverse aquatic environments. The east-west ribs are the many and highly diverse wetland and other terrestrial habitats that intersect the rivers. Why is the Mobile Delta important? The region’s unusual—and in many cases unique—biological diversity could become an important storehouse of critical species and genetic material that would be shared with all of eastern North Americaas the climate continues to warm. The Mobile area has been an important focus of North American settlement and civilization for thousands of years. Shellmounds represent the remains of some of the nation’s earliest architecture; Mound Island represents one of the most elaborate and sophisticated cities of the era before Columbus; and Mobile was one of eastern North America’s oldest European settlements and is the oldest extant city on the Gulf Coast, predating even New Orleans. The city also claims one of the largest and most architecturally diverse historic districts in the country. Mobile represents an unusually broad spectrum of the United States’ cultural heritage. Established as a French colony with on-going influence and intermarriage with First Nation communities, Mobile became one of the most important trading centers of Spanish West Florida. From the earliest, its cultural heritage has continued to be bolstered by immigrants from Africa, the Caribbean, Britain, Ireland, Scotland, Germany and other European countries, with notably large influxes of Jews, Lebanese, Greeks, and most recently Vietnamese, Cambodian, Laotian and Thai people. Mobile and the Delta are the gateway to much of the nation’s most important historical events, from Aaron Burr’s and William Bartram’s visits early in the nation’s history to the docking of the nation’s last slave ship, the last battle of the Civil War, the creation of Africatown and the march for Civil Rights. Mobile is also a city of many firsts, including the Gulf Coast’s first Mardi Gras. The region has played a critical role in the development of natural history research, from the early visits of Charles Lyell—who help inspire Darwin’s famous theories—and Phillip Henry Gosse in the 19th century. Lyell’s collections along the Alabama River are in museums across the world, and have played an important role in the development of geological and evolutionary theory. What are some specific examples of the area’s exceptional biological diversity? The larger Mobile basin—the network of rivers and streams that ultimately drain through the Mobile Tensaw Delta— represents one of the world’s richest aquatic environments, with what is likely the most diverse concentration of fish species in the temperate world, and the greatest diversity of mussels, aquatic snails and crawfish in the world. The state of Alabama, dominated by the Mobile basin, has the greatest number of fish species of any state. A single small river, such as the Cahaba, can have two to three times more fish species than the entire state of California, and almost twice as many species as the entire Western European floristic province. The greatest concentration of turtle diversity in the world is centered on Mobile, Baldwin and Clarke counties. The Delta floodplain—the flat, wet, and frequently flooded habitat at the center of the area—represents one of the largest and best preserved deltaic systems in the lower 48 states, covering some 300,000 to 400,000 acres. While it is not the most diverse habitat of southwest Alabama, it is among the most biologically diverse systems of its kind in the United States. 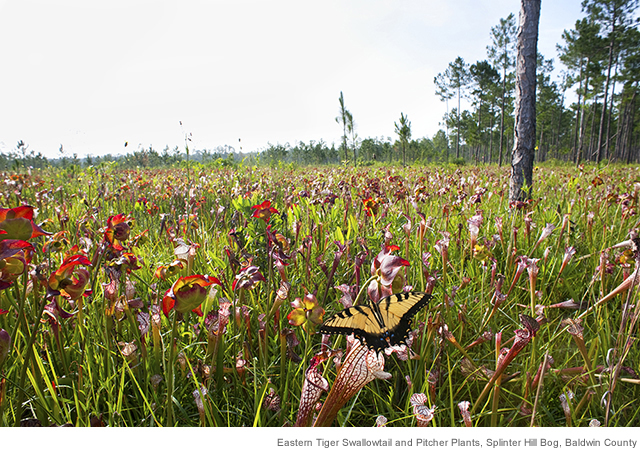 Areas of moist longleaf pine forest surrounding the Delta include what many believe to be the greatest concentration of plant species in North America, ranging from 40 to 60 species per square meter. At that scale, that is among the most diverse floral habitats globally. Mobile County has the greatest concentration of grass diversity recorded in eastern North America, and its diversity is exceeded only by a handful of much larger counties in the southwest. Alabama, along with Georgia, supports the eastern United States’ greatest concentration of oak species. Much of that diversity is centered in areas like the river bluffs or the Red Hills region overlooking the Delta and that Alabama River. A single hillside may support 20 species of oaks, seven species of magnolia, six or seven species of hickory, a half dozen species of rhododendron, along with dozens of other species from temperate beech and maple to subtropical palms and titis. The region is a crossroads between the eastern and western Gulf Coastal Plain regions, regions counted among the global hot spots for endemism—species that exist nowhere else—and total biological diversity.